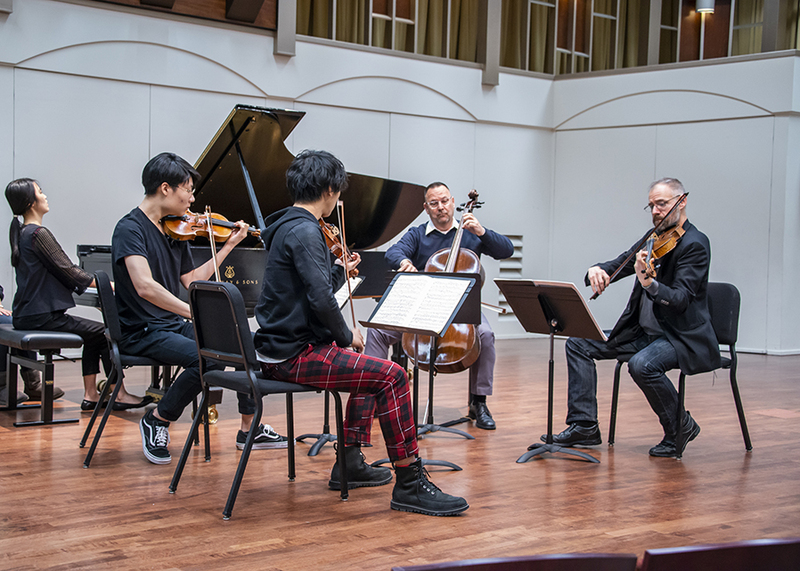 CSUN students in Bin Huang's master class during ChamberFest @ CSUN, left to right: Yu-ting Peng (piano), Joshua Rim (violin), Kazeoki Katagiri (violin) , Michael Gintz (cello) and Greg Von Notias (viola). Photo by David J. Hawkins. CSUN student Yu-ting Peng, at the piano, during the master class taught by Bin Huang during ChamberFest @ CSUN. Photo by David J. Hawkins. 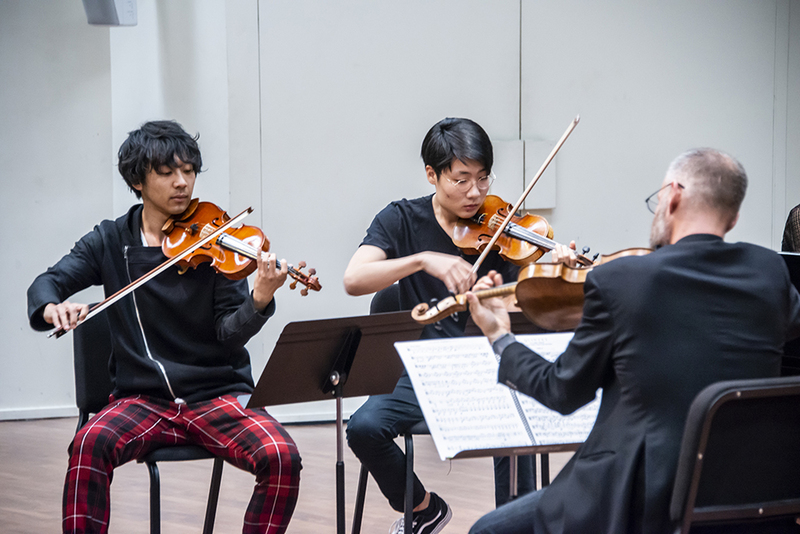 Violinists Kazeoki Katagiri and Joshua Rim perform in Bin Huang's master class at CSUN's ChamberFest. Photo by David J. Hawkins. 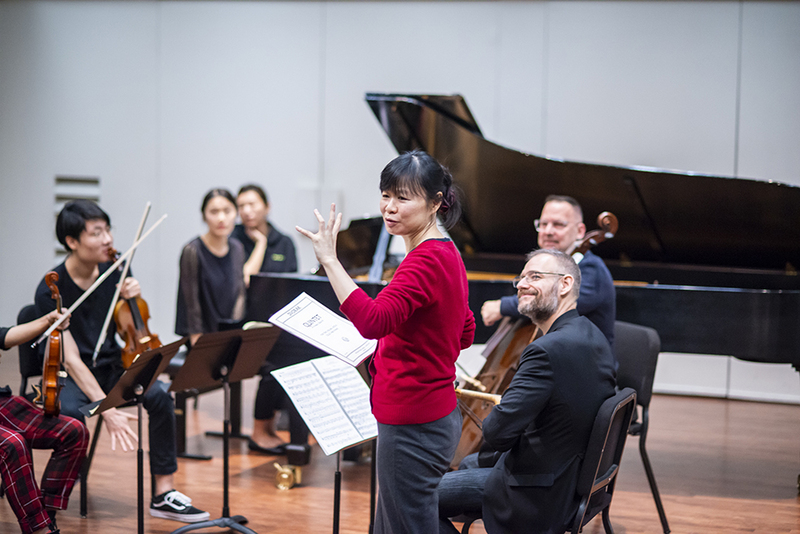 Bin Huang (in red), a violinist who is currently chair of the Orchestra Instruments Department at the China Conservatory in Beijing, leads a master class as part of CSUN's ChamberFest @ CSUN. Photo by David J. Hawkins. 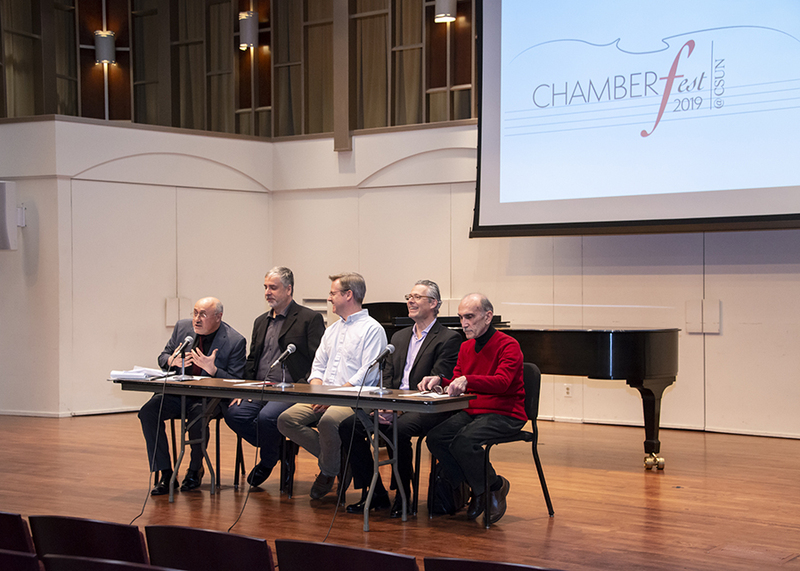 A ChamberFest @CSUN expert panel discussed the importance of chamber music and the composition process. Left to right: Dmitry Rachmanov, co-director of the festival and chair of keyboard in the CSUN Department of Music; composer Liviu Marinescu; composer Arthur McCaffrey; Lorenz Gamma, co-director of the festival and head of string studies in the Department of Music; and composer Frank Campo. Photo by David J. Hawkins. On Jan. 24, in the intimate setting of California State University, Northridge’s Cypress Recital Hall, Liviu Marinescu’s piece “Moto Perpetuo” began with just the strings. With faculty member Lorenz Gamma on the violin and Los Angeles local Dustin Seo on the cello, the two melodies began to overlap. Moments later, CSUN graduate student Larry Kaplan ’14 (Music Performance – Woodwinds) made his entrance on the flute. The three instruments seemed to converse with each other, followed by the sparing notes of Ming Tsu’s piano. As the musicians listened and responded to one another, the music’s melody evoked the sensation of slipping into a dream — a dream which might even become a nightmare. Like sailors navigating a ship across a stormy sea, the intensity of the strings whipped the listener into a windy, wild world of the unknown. The evening was the first of many events in the “ChamberFest @ CSUN” festival — four days of chamber music performances, lectures and master classes hosted by CSUN’s Mike Curb College of Arts, Media, and Communication, highlighting the talents of visiting musicians, faculty, alumni and students in the music department. ChamberFest was designed to explore the art of chamber music and to provide world-class entertainment by distinguished chamber musicians, as well as an opportunity for students to learn more about the process of composing, creating and performing chamber music. The art of chamber music is inherently intimate, given that it is performed by a small ensemble. Chamber music is played one musician to a part, with no two instruments playing the same musical line. Participating in active listening is crucial to any successful performance. Exploring a range of rich musical literature, from Beethoven to Schubert, Dvořák to Prokofiev, the master classes, performances and lectures offered a close look at musical greats and the art of chamber music as a whole. 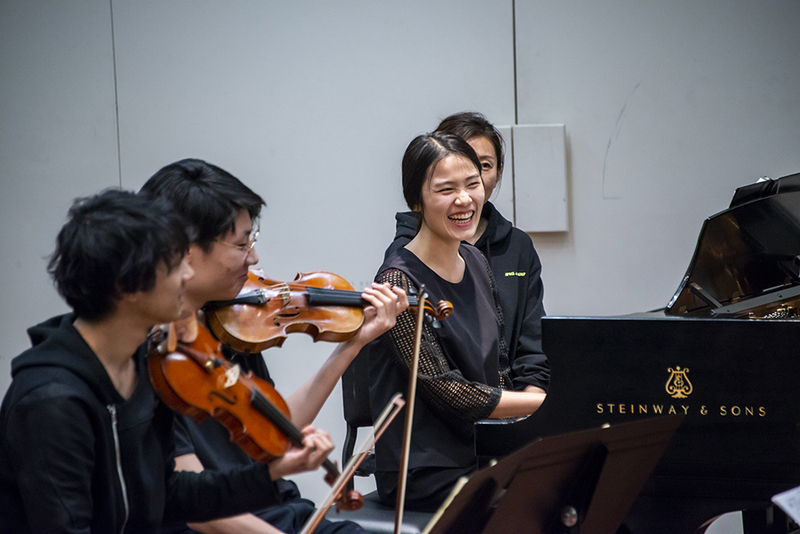 The classes included instruction from a range of musicians, including Bin Huang, a master violinist and director of orchestral studies from the China Conservatory in Beijing; Alan Chapman, a KUSC radio host, educator and lecturer and who is a regular speaker on the Los Angeles Philharmonic’s “Upbeat Live” series; and Yuan Sheng, a pianist from the Central Conservatory of Music in Beijing. The Department of Music hopes to continue this celebratory and comprehensive festival in years to come, with the intention of inspiring the CSUN community and greater LA community alike to engage in and support chamber music. Prior to the performance of Marinescu’s piece, a panel discussion titled, “The Creation of Chamber Music – a Composer’s Perspective” — moderated by the directors of the event, Gamma and Rachmanov — discussed the importance of chamber music and the composition process as a whole. The panel featured Frank Campo, Marinescu and Arthur McCaffrey, all of whom are world-class composers and musicians, as well as professors at CSUN. “You have to think in a different mindset when you write for the orchestra,” said Marinescu. Much like his piece, chamber music is always changing and shifting, dependent on individual players as they weave together a cohesive composition in a collaborative fashion.